Where to Buy Kopa Insecticidal Soap, Kopa Insecticidal Soap Insecticide Miticide Fungicide - 2.5 Gallons - $94.95 for Sale with Fast Free Shipping! 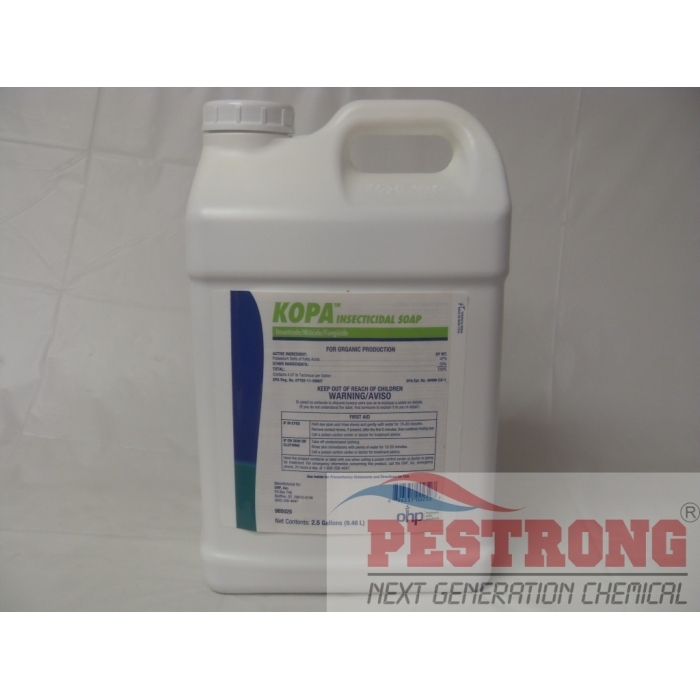 Kopa Insecticidal Soap Insecticide Miticide Fungicide - 2.5 Gallons is a potassium salt of fatty acid soap that controls insects, mites and powdery mildew on vegetables, fruits, ornamental plant in greenhouses and outdoors. Kopa Insecticidal Soap can be used for organic production. Kopa Insecticidal Soap will control powdery mildew and listed insect pests such as: adelgids (woolly aphids), aphids, lacebugs, mealybugs, mites, leafhoppers, scale insects, plant bugs, sawfly larvae (e.g. pear and rose slugs), psyllids, tent caterpillars, spider mites, earwigs, whitefly. Kopa kills by suffocation, disruption of cellular membranes, and removing protective waxes covering the insect which results in dehydration. The insecticidal soap works as described and it is organic which is always a welcomed plus. It works very well. this worked much better than my expectation, and free shipping, Thank you pestrong! working very well and thank for fast shipping ! also lowest price ! thank you guys so much. Very helpful information and free shipping. thanks.